In May, hundreds of thousands took to the streets in my country of origin, Turkey. Medias were talking about the destruction of a park and the islamization of society; not convinced by these explanations, determined to get involved and to understand what was going on, I decided to go to Istanbul. There, I came to understand that the underlying cause of this movement was capitalism, so developed in Turkey that we used to call it “Little America”. Tens of thousands crossing the Bosphorus to get to Taksim. Morning of June 1st. Photo via Twitter. It all started with about 70 « Right to the City » activists opposing the destruction of Gezi Park, on May 27th 2013, in the heart of Istanbul. At that point, no one knew that it was the beginning of a major popular uprising. A few well-organized and courageous people fought for what they thought was right; shocked by violent police interventions, at first thousands of others, then hundreds of thousands, took to the streets. In a few days, protests took place all over the country, and, in Istanbul, crowds had pushed back police forces and the occupation of Gezi Park had begun. But this was not the first time that protestors had faced violent police interventions. A few weeks before, the historic gathering of 1st of May was also barred, with the same brutality, from taking place in Taksim Square where it traditionally belonged. As for freedom of expression, the NGO Reporters Without Borders had published a 2012 report titled « Turkey – World’s Biggest Prison For Journalists ». In neighborhoods like Gazi in Istanbul, the poor and the minorities from all around the country grew up with gas bombs, water cannons, rubber bullets, and for many, even real bullets and military interventions. The privatization of public space and resources are also not a new thing in Turkey. Take the HES (Hydroelectric power plants) projects for example, thousands of which are being built all over the country. Natural water resources are being privatized, rivers decimated and the environment, as well as rural communities, are paying the high price for a profit which is also privatized. So while Gezi Park was a beginning, it was certainly not the origin. It was THE spark which brought together dozens of associations and political parties as well as millions of individuals from all around the country. Thus, we should never underestimate what a few organized people like the ones of the Right to the City Movement can accomplish. Since the Gezi uprising, demonstrations of local, national and international solidarity have been taking place frequently. We saw grandmothers bringing home cooked meals to the « Revolutionnary Market » of Gezi Park where everything was free. We saw, nationalist Turks fighting against police repression alongside Kurds, people opening their homes to protestors seeking refuge from police violence. We saw a kilometer-long « peoples » Iftar-table (evening meal when people break fast during Ramadan) stretching along the floor of the busiest street of Istanbul (Istikler) where believers and non-believers got together to protest against the government’s fancy banquet at Taksim. 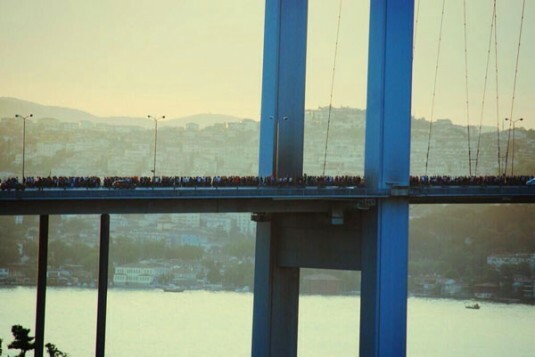 Every day for a month and a half, solidarity protests took place in different cities across Turkey. Solidarity protests have also taken place at the international level in China, Bulgaria, Argentina, the UK, the USA, Switzerland, Syria, Spain, Chile, Brazil, Norway, Germany, the Czech Republic and more. 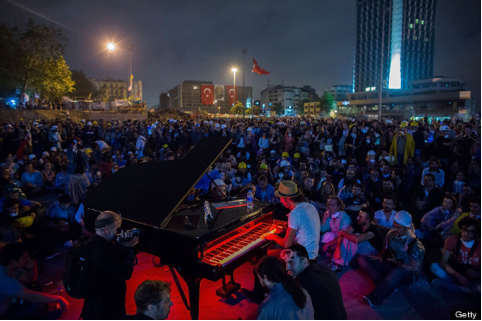 A pianist came all the way from Italy, with his piano, and played for many hours for the protestors at Taksim square. People don’t stay in the streets forever and that’s only natural. This wave of protests might fade away but these memories won’t; these memories will stay engraved in people’s minds, reminding them what it felt like to work together, for each other, instead of everyone for himself. Whatever happens next, the Gezi movement has considerably expanded the culture of resistance and solidarity in Turkey and has brought a large wave of politicization. When I asked different people at the protests what they think had changed, two things were frequently pointed out. First, there was a growing distrust in the ruling class private and public institutions like the mass media channels. These mass media channels had proven to consistently and repeatedly lie about, manipulate, and hide the true facts concerning the protests. Secondly, what many in Turkey called « the wall of fear » of protesting against the government had fallen. We live in a world where, the « World’s richest 1% own 40% of all wealth » and « 50% of world’s adults own just 1% of the wealth » according to the article published by The Guardian in 2006 and which is based on a UN report. This is inherent to the capitalist world-economy and Turkey is not an exception. The exploitation and the oppression of people, as well as the concentration of wealth and power are all results of the capitalist-imperialist system and cause « Uprisings Here, There and Everywhere » as professor Immanuel Wallerstein summarized it. When we mistake a consequence (here police violence) for the cause (the capitalist system) we lose sight of our objectives – as had many protestors I spoke with in Gezi Park. When I asked, why are you here? « We protest against police repression and want to reestablish a Turkey of Ataturk », said a young woman from the « Young Turks », a Kemalist youth group, during a protest in Taksim square in late June. A taxi driver told me on my way back from Gezi Park one night that « Turkey is the freest country in the world ». This at the time where more than 7000 protestors had been injured – five of them brutally killed, with dozens of others still in critical condition according to the Turkish Medical Association. « I traveled through all of Europe as a truck driver, trust me it’s much worse over there. You are free to peacefully protest in Turkey, nobody will stop you », he added. Whenever the people rise up, representatives of the ruling class put in great efforts to try to convince the people that some specific issue is the source of the problem (lack of democracy, « extreme » use of force, authoritarianism…). The goal is to portray all social, economic and political problems as being independent and isolated from one another so that the people do not question the system as a whole. The fact is that these problems do not disappear after reforms are brought to a political or economic system. Rather, they keep coming in other forms because they are all inherent to the capitalism. This doesn’t mean that we should abandon immediate issues such as the destruction of a park in the heart of Istanbul. The basic problem has always been the same, the solution as well: anti-capitalism with the aim to put in place a truly democratic and socialist alternative. This is not feasible without a much larger, deeper and bottom-to-top organization of people in all branches of society. Coordination of people across borders and the setting aside of « nationalist temptations » will also be required. This will not happen over night, but failing to understand this will make us lose sight of the true cause of our problems. The consequence of this failure will be to fall into illusionary reformism which will only change the face of the problem, but will not bring us the freedom that we are fighting for. Nice article, but few comments. I can understand the protest against police oppression and lack of « press » freedom, but is it not too much noise for so few? I mean…I’m not devaluating the importance of press freedom, but when you know that « most if not all » of the world media are corrupted and that their information is totally manipulated, how can people fight that bad for it? And when I say « most » I include all the european and american press (recognized by all as models of freedom). Also about the police repression, I just think that all over the world people die and are injured every time they decide to face the police and their governments. the only thing is to determine if what you are fighting of protesting for deserves that you sacrify your life. So I understand the « global » feeling of those people when I read your article, but looks to me that nowadays some people of this region of the world are mostly being manipulated (by who? good question) and are sometimes fighting for unclear and unjustified causes. (i.e. Egypt). @Anas M. : what do you mean by “some people in this region of the world” ?? Your commentary sounds like you had already an idea of “the people in this région of the world” before you started to think the problems they are facing with. Why should they be more “manipulated” than others, like the people of your region of the world ? 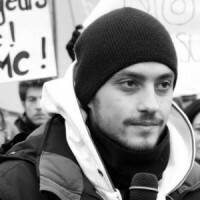 @ Akan Akin : your article is maybe the only one I read, among thousands, which truly focuses on the real change currently occuring in Turkey : an unlimited economic liberalism. I was in Turkey, more precisely in Ankara, when the popular uprising rose up. And what rioters particularly targeted were advertising billboards and banks windows. But this face of the coin was hidden behind the fight against political authoritarianism, a crucial point but not the only one.